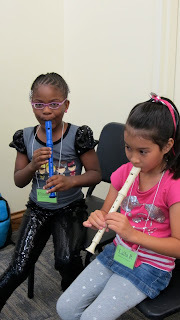 Patel Conservatory: From the Blog: Welcome summer campers! Music student get to try the flute. Summer is in full swing here at the Patel Conservatory! We welcomed our first round of summer campers this morning with the start of both the Junior Intensive and the Instrumental Petting Zoo. This week, students in our Instrumental Petting Zoo will have fun exploring instruments of a band and orchestra. They'll learn more about woodwinds, strings, percussion and brass, and get to try out many of them! In dance, we have more than 100 students in the Junior Intensive, our most ever in that camp! These students will spend the next two weeks focusing on improving their ballet technique. They’ll also get experience in tap, jazz, musical theater and performing arts. There’s still spots available in many of our summer camps in dance, music and theater! Spend your summer with us, exploring the performing arts! For availability, call our registration office at 813-222-1002. Junior Intensive students began the day with placement classes in TECO Theater.